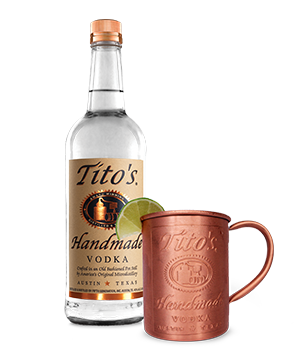 Tito's is a super-premium handmade American vodka from Austin, Texas. 100% American corn, gluten-free and a 6-stage distillation process in copper pot stills. Tito's Handmade Vodka has enjoyed unrivalled success in America and is now one of the country's best known spirits. 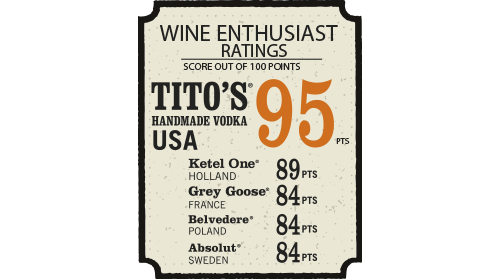 Tito’s Handmade Vodka scored the highest points in a vodka quality test by the Wine Enthusiast Magazine. Tito’s has also won many other prizes, such as the SF World Spirits Championships: Double Gold. This cocktail of ginger beer, lime and Tito’s Handmade Vodka has a kick that only Texas can give.